We left the rugged ranges and even more rugged road of the Bungle Bungles and headed back down the highway after re-inflating the tyres for the umpteenth time. On the way back down to Halls Creek we needed to refuel with one of our jerry cans. I have three – two plastic and one old school metal – I’d filled all three when doing the Gibb just in case and still hadn’t had to use the metal one. The funnel that connected to the metal jerry can was in the back box of the camper which had been locked shut full of dust for the last week so I had to use a little funnel to empty the fuel from the metal jerry can, into an empty plastic jerry can and then into the car. It was a delightful pitstop made even better when I realised that the catch on the metal jerry can wouldn’t close no matter how hard I tried so I gave up and stuck gaffa tape over the opening to keep the inside clean and headed to Halls Creek for a proper refuel and hopefully some assistance. When we got to Halls Creek the queue at the servo was a mile long – they had no Diesel at their normal pumps so everyone was lining up then going in to ask where they could get Diesel before moving off. Luckily for me they had unleaded but there was no way I was getting help with my stubborn jerry can with a mob of grumpy grey nomads trying to get answers about when they could get fuel so we headed off. It wasn’t long before we hit the turnoff to the Tanami and the road looked like it was in pretty good condition. We let down the tyres 25% and headed off down the road – so much better than the road into the Bungle Bungles and even the Gibb. It’s funny how the kids games change as you get further along a trip like this and they learn new and practical things. 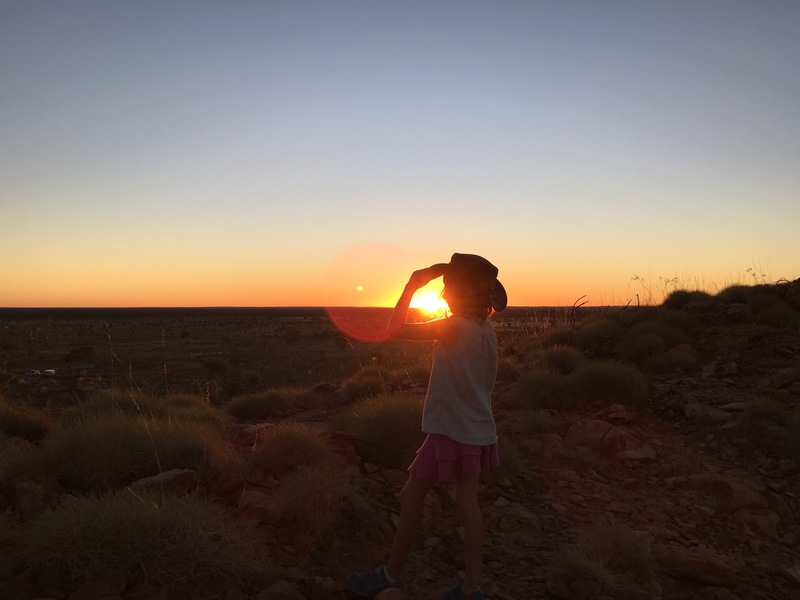 Miss6 started out this trip playing make-believe games about being a rockstar and doing concerts and now she plays games about camping and asks things like ‘what tyre pressure do you use on the dirt roads?’ rather than ‘what colour outfit do you want to wear to the concert?’. 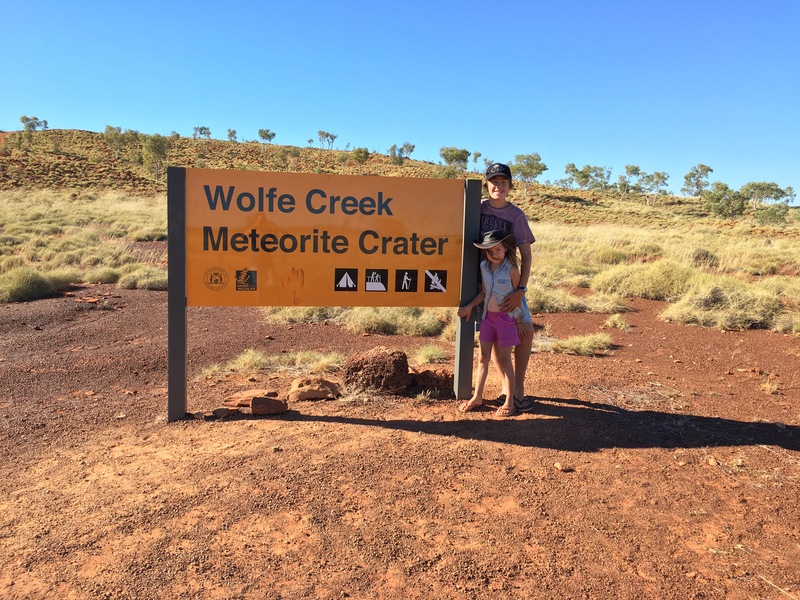 The entire drive to Wolfe Creek Crater I kept telling myself ‘don’t think about the movie’ and I reckon I replayed the movie almost scene by scene in my head! The kids wanted to watch the movie so they knew why I was trying so hard not to think about it – especially after I’d told them that their dad used to do impressions of one of the characters to give me nightmares for a laugh. When we drove into the entrance there were a bunch of abandoned buildings and sheds on the side of the road which looked a bit eerie – especially with one of them displaying ’12 people died here stay out!’ in spray paint! I did have to laugh at one of the Wikicamps entries though that had ‘the crater was great but our car wouldn’t start when we got to the carpark – lucky there was a lovely truckdriver there to help us out – Aussies are so friendly :)’ and at the main sign to the crater someone had put a red hand print smeared down the side of it to look like blood. We got to the crater in time to walk up to the rim and make a start at walking through the crater. The aim was to get to the other side and watch the sunset from the top of the crater on the eastern side. We got about 3/4 of the way through and found an abandoned cap on the ground which looked just like my castro cap – this made me feel a bit uneasy, as did the fact that we couldn’t see any obvious sign of a pathway back up the side of the crater when we got to the other side and the sun was dipping rapidly in the west. 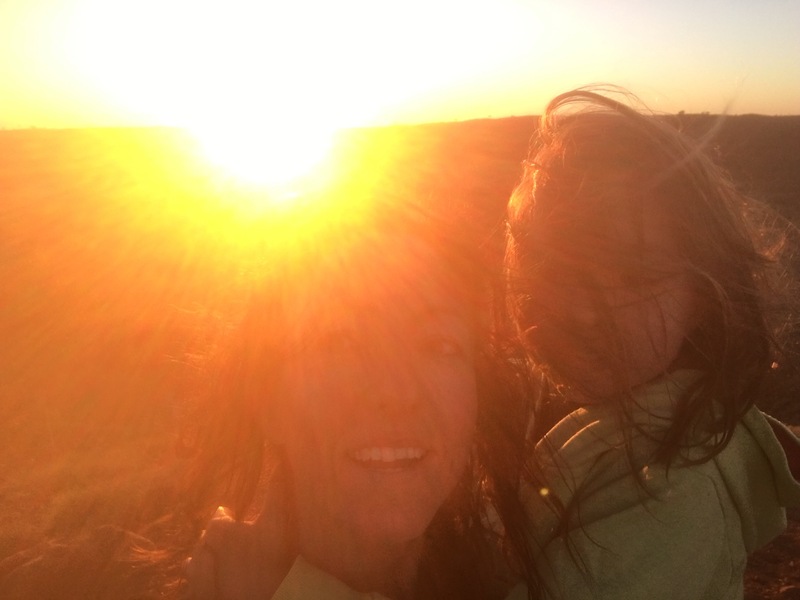 We decided to turn around and walk back through the crater and watch the sunset from the western side of the rim instead. 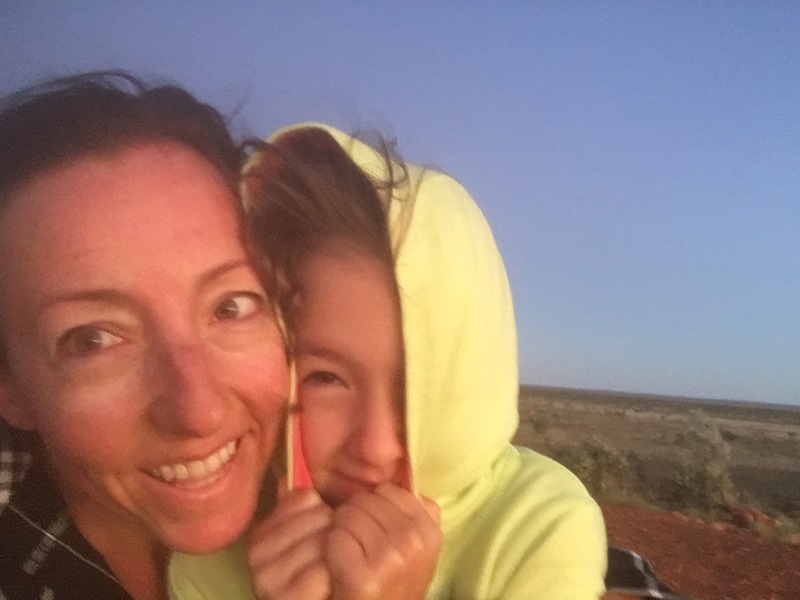 I’d heard that sunrise over the crater was pretty spectacular so after watching a DVD in the van before bed (no, it wasn’t Wolfe Creek), we set the alarm for 5am so that we could hike up the crater. Miss6 was keen to join me for the early morning spectacle, Master14 however, didn’t see anything good coming out of getting up that early so he stayed in bed. We’d kept the car hitched to the van for a quicker pack up so Miss6 and I walked to the day use area carpark. The walk was a lot longer than I thought and I started worrying that we would miss it so I put Miss6 on my back and started to run up the road. We made it in plenty of time to walk up the side of the crater and sit on the rim ready for sunrise. 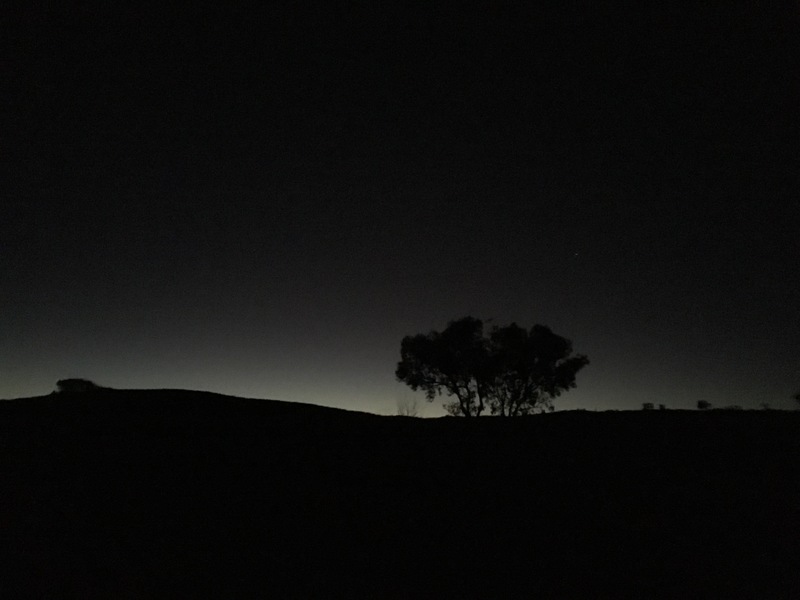 The early morning night sky was just as spectacular as what I was expecting from the sunrise – the night was so clear and the silhoutte from the crater as we approached it was serene and beautiful. The wind blowing directly at us from the rim of the crater however, was anything but serene. There was another family at the top with their young daughter who was crying from the cold wind. Her dad eventually ran back to the car (they’d driven to the day use area lucky things) and grabbed a picnic rug so that his wife and daughter could wrap themselves up in it and shelter from the wind – they were generous enough to share this with Miss6 and I so we got a little reprieve from the wind. 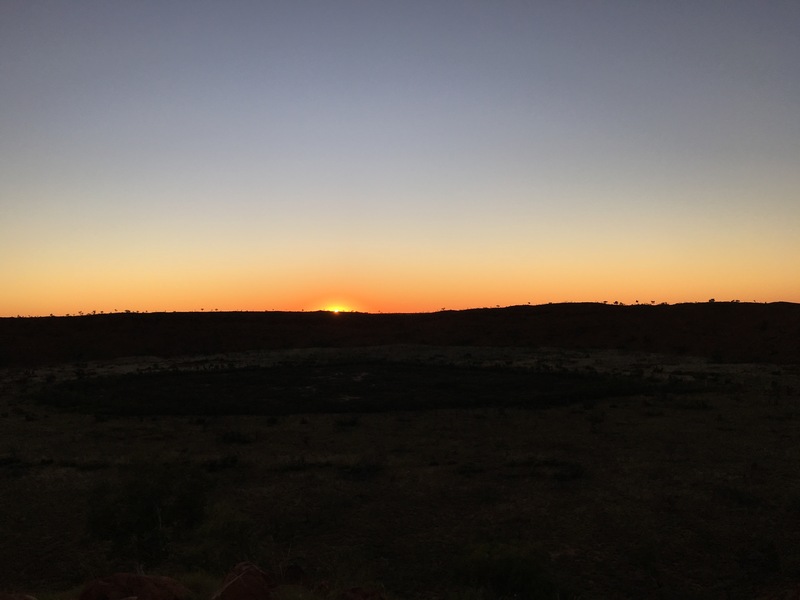 With tears in our eyes (from the wind not the view) and noses running, we watched the sunrise first as a mass of colour in the far off distance and then, as it rose over the edge of the crater wall. It was a long wait in the wind but well worth it for that view. Our picnic rug sharers kindly gave us a lift back to camp in their car so that we didn’t have to walk back. When we got back to camp we woke Master14 and happily bragged about the glorious views we’d just witnessed while he’d been snoozing. 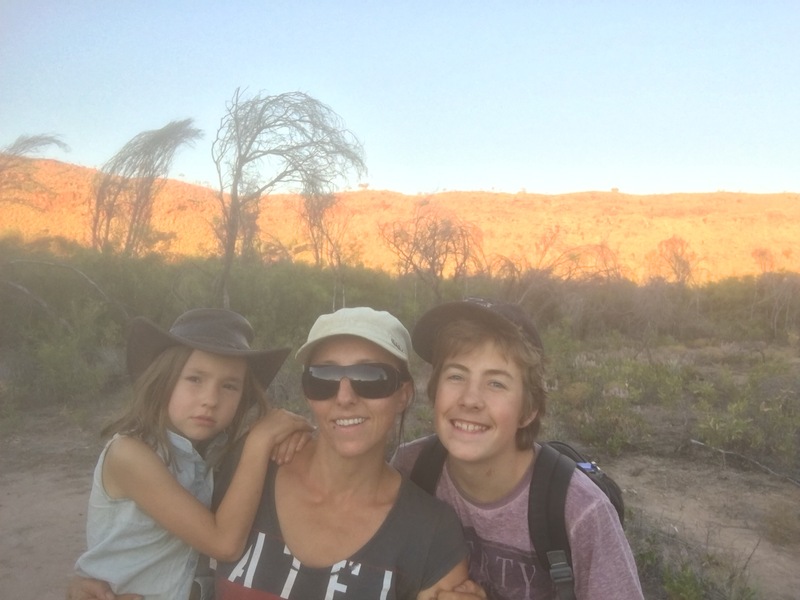 We packed up the camper and drove to the day use area to read up on the crater and have one last look before we hit the road again on the way back to Fitzroy Crossing for some green grass and with any luck a powered site.